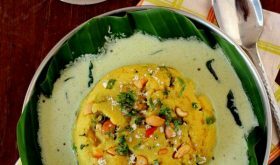 When Satish and I visited a dear friend’s home a few years ago, one of the breakfast treats we indulged in was Adai, a protein rich crepe aka dosa that is a staple of the Tamilian vegetarian diet. 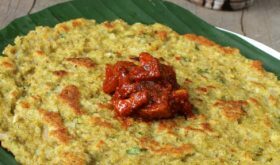 Its a slightly thicker version of the famous Andhra Pesarattu which is prepared with green moong dal, ginger and green chilies. 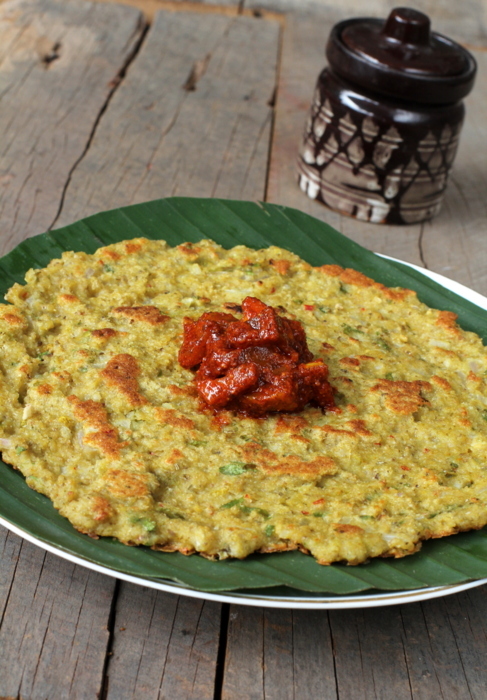 But the traditional Adai recipe calls for 3-4 varieties of lentils besides raw rice, red and green chilies and ginger. I hope many of you looking for healthy oats recipes in Indian style are finding the oats for breakfast series useful. To boost the already nutritious profile of Adai, I added fibre rich oats to the lentil-rice batter. The addition of oats did not alter the taste of Oats Adai and my folks relished the crisp lentil dosa with pickle. 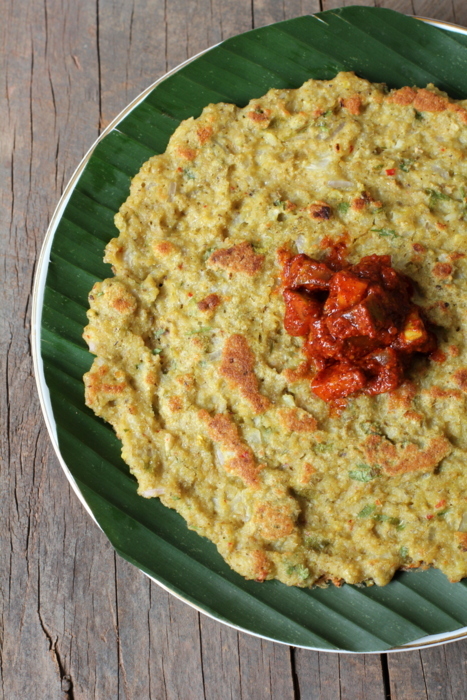 I highly recommend you try Oats Adai recipe for a filling, healthy and tasty breakfast. Soak dals in water for 3 hours. In a separate bowl, soak rice in water for 3 hours. Drain and grind rice, green chilies, red chilies, ginger and aniseed to a paste. Add very little water to make a smooth paste. Pour the batter into a bowl and keep aside. Now grind the dals, oats and salt to a slightly coarse paste.. It should be like a thick dosa/pesarattu batter. Pour this dal batter into the rice batter bowl. Add chopped onions, asafoetida, turmeric powder and coriander leaves and mix. Heat a cast iron pan or non-stick pan. Once hot, reduce flame, sprinkle few drops of water such that they sizzle. If the water sizzles, it means the pan is right to spread out the adai batter. Pour a ladle full of batter in the center of the pan and swirl around with back of ladle to form a concentric circle like a thick dosa/uttappam. Drizzle few drops of oil around the edge of the adai/dosa and a few drops over the dosa. Allow to cook on low to medium flame for 2-3 minutes. When the bottom of adai lightly browns, flip over and cook for another 2-3 minutes on low to medium flame. 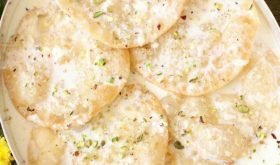 Remove onto a serving plate and serve with chutney or pickle of your choice. 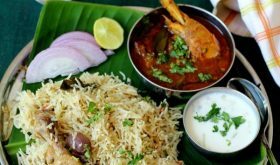 You can substitute rice with broken wheat/dalia. If using broken wheat, soak in water for half an hour before grinding. 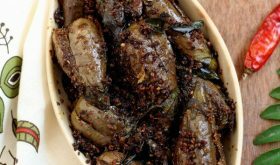 You can substitute asafoetida/hing with 2 cloves of garlic. 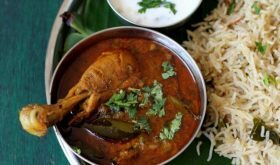 One or two tablespoons of grated coconut can be added to the dals during grinding process. By Sailu Published: November 1, 2012 Oats Adai, a healthy Indian breakfast recipe goes well with any chutney. A protein rich oats recipe from India that also makes for a nice evening tiffin. Wish i get this healthy,nutritious adai for my breakfast,.. Tried it. And we both loved it! Didn’t have yellow moong dal, so substituted that with masoor dal (I had chilka moong dal, didn’t think that would have been a value add with green whole moong) Saunf was a great addition! Added a new twist of taste. The batter was a bit difficult to spread though, and somehow I tried long on a low flame, but the Adais were not as crispy as a usual dosa. Thats expected right? Yes, they are not crispy dosas. Tried it…just loved it! !..infect better than the other chillas,as found it pretty light to digest. can we store the batter over night in fridge? I tried this last nite for dinner and my whole family loved it. Especially my 2 1/2 years old daughter. She ate two pieces and wanted more! Thank you Sailu!